Here you can see the circus tent, with the crane in the background to construct the new building. In the initial days of Tuscarora’s ministry nearly 50 years ago, the site where the gymnasium stands was very different. 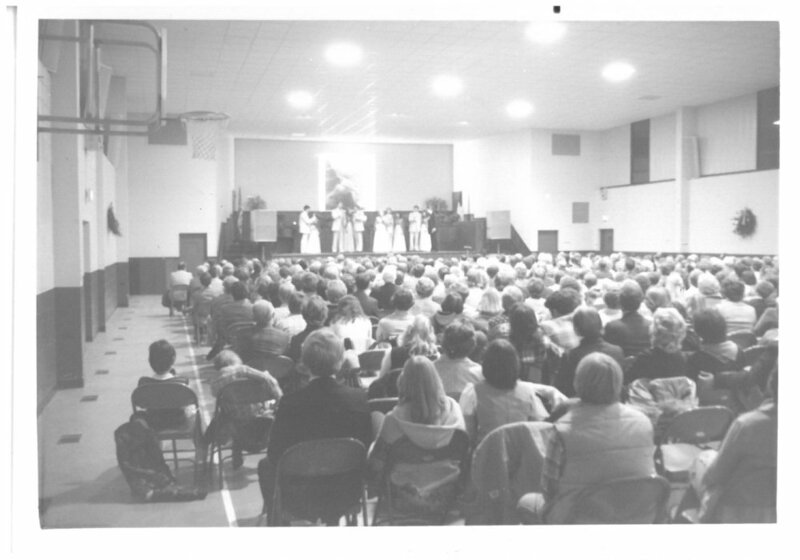 At the purchase of the grounds in 1971, there was no meeting location large enough to hold all of the guests together, and a circus tent was constructed temporarily on the site where the gymnasium sits today. It is hard to imagine the changes that would take place on this spot thanks to the incredible testimony of God’s providence and the faith of those who support this ministry. 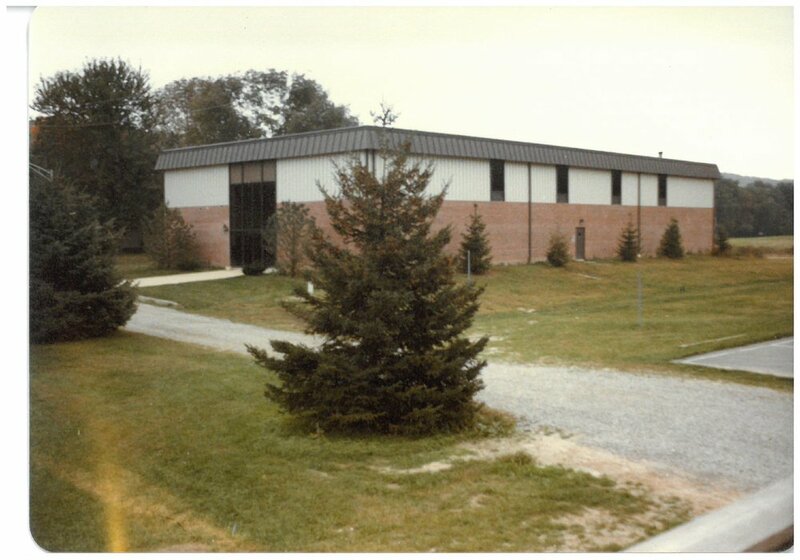 In 1975 Olav B. Olsen began construction of a multipurpose Chapel/Gymnasium that would eventually carry his name. At the time of its dedication Olsen wished for all the recognition to go to God, refusing to be recognized for his contribution in building the facility. The word’s “To God be the Glory” were painted above the main entrance where they remain today. During the next 30 years this building hosted Christmas and summer concerts, conventions, retreat meetings, and sports facilities. 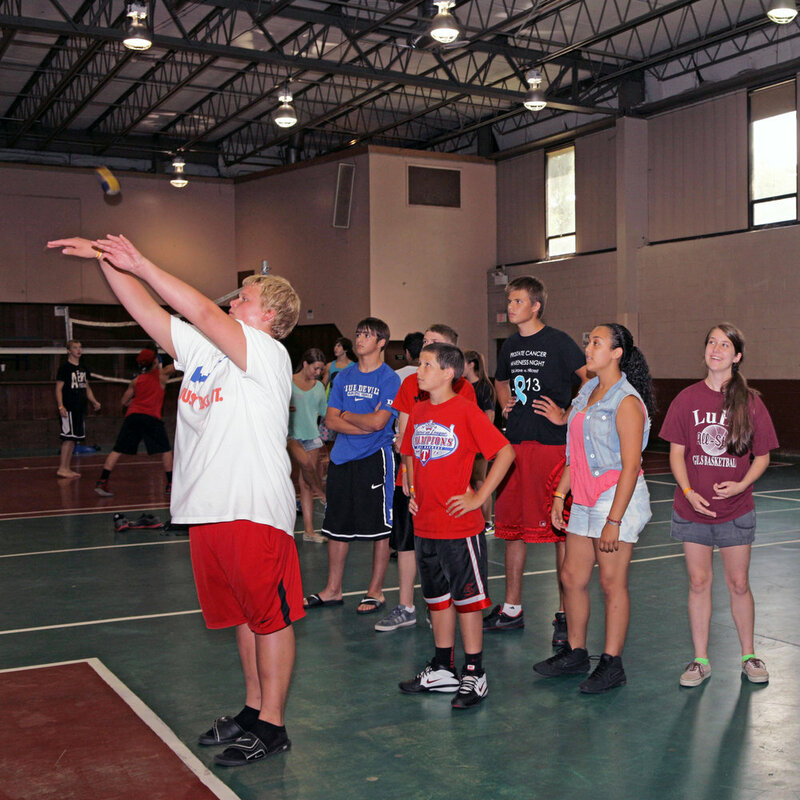 Since the Senum Thompson Center was built in 2002, the Olsen Activity Center has found a second life as a gymnasium. As the years went on and a future was being decided for this special place, the building began to show its age. With an original cement floor that needed more than another coat of paint, a dark color scheme on the walls and ceiling, peeling sound insulation, and an unused stage the time had come for some significant improvements. After being repainted for the last time in 2017, work began to grant this building the makeover it had waited for. First, the back wall that had previously been covered in carpet-like insulation was stripped. When new plywood walls were hung, they were painted in brighter neutral greys. New backboards and a professional cleaning got the gym ready for the summer of 2018, but, it was still far from its final state. Despite all the improvements, it soon became obvious that all of the hard work didn’t look very impressive because the cement floor remained. But the cost for a new athletic floor was daunting. As Tuscarora was ready to decide to lay another coat of paint and hope for the best, several loyal donors banded together to cover the cost of the materials for a brand new athletic floor! The still impossible price tag was made possible by a final gift from Brian Garnier of Brian David Flooring who donated his team for a full week to install the material. When this gift was given, the project moved forward quickly. The stage was removed making room for ping pong tables and fellowship areas. Then, the concrete was prepped for the new flooring and the materials were installed. Brand new hoops were ordered and delivered just days ago for full court basketball and lines were painted to complete the look of the gym. Whether this spot held a circus tent, an auditorium, or a gymnasium God’s work here was supported through volunteers and donors. Each time Tuscarora wondered where the resources would come from to continue our ministry, God provided a gift. Without servants who volunteer their time and the loyal donors who support Tuscarora this would not have been possible. This building has been the location for so many special moments, the home of tournament celebrations and bonding snack breaks, and even at times a quiet place to hear the voice of God. Throughout the last week many staff members and guests have exclaimed, “It looks like a totally new building!” The great news is that it’s still the same wonderful building, with all the same memories and roots, but now it’s ready for the years to come. To make more projects like this possible, support the ministry of Tuscarora by making a gift here.